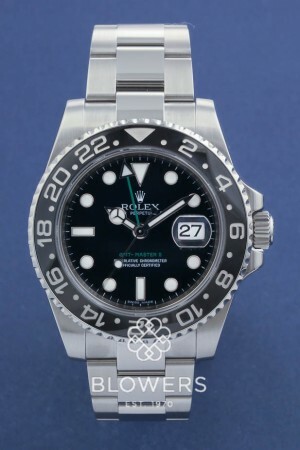 Rolex Oyster Perpetual GMT-Master II Ref 116710LN. Polished and brushed steel case, 40mm diameter with larger winding crown, water resistant to 100 metres. Calibre 3186, a self-winding mechanical movement entirely developed and manufactured by Rolex. Black dial with luminescent hour markers, In addition to the conventional hour, minute and seconds hands, it features a 24-hour green hand to display a second time zone. Steel Oyster lock bracelet with comfort extension link. Box and papers dated May 2010. SKU: 3108870. Categories: Gents, GMT-Master II, Rolex.